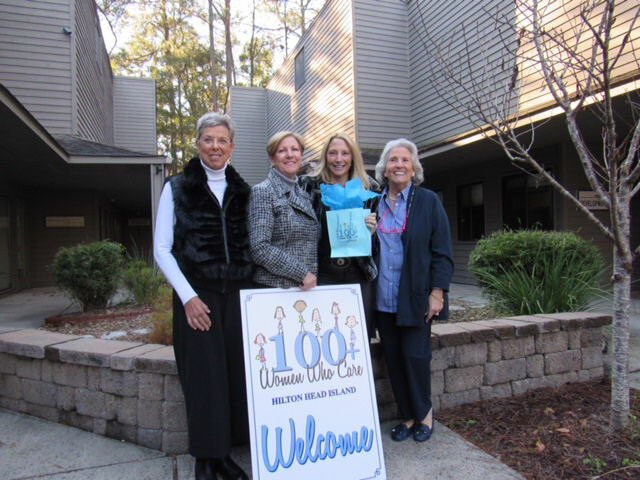 At our fourth quarter meeting, 100+ Women Who Care Hilton Head Island learned that our organization had been chosen to join hearts and hands with the Village of Wexford for their Day of Celebrating Women on May 18, 2016. All proceeds collected would benefit the charity for which we voted. Backpack Buddies was our selected organization. 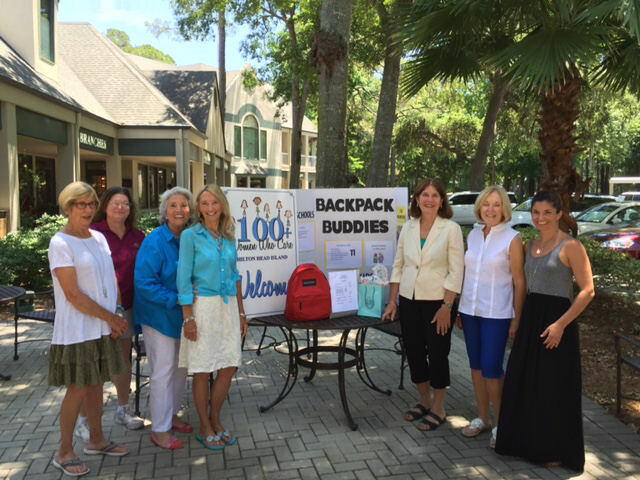 Backpack Buddies of Hilton Head serves 260 children in the three public elementary schools on the island. Eligibility for Backpack Buddies is determined by social workers who are knowledgable about family need. Every Friday, during the school year, designated children in kindergarten through fifth grade receive a bag of supplemental food items for the weekend. The annual cost of supporting one child through Backpack Buddies is $180. On Friday, May 27, 100+WWCHHI and Sarah Perry, from Branches, presented Jeanie Silletti and Debbie Dunlap, directors of Backback Buddies, with a combined donation of $12,509.27. This is a significant contribution and one that is certain to make an impact in our community! Our collective giving has once again made an impact on our island! 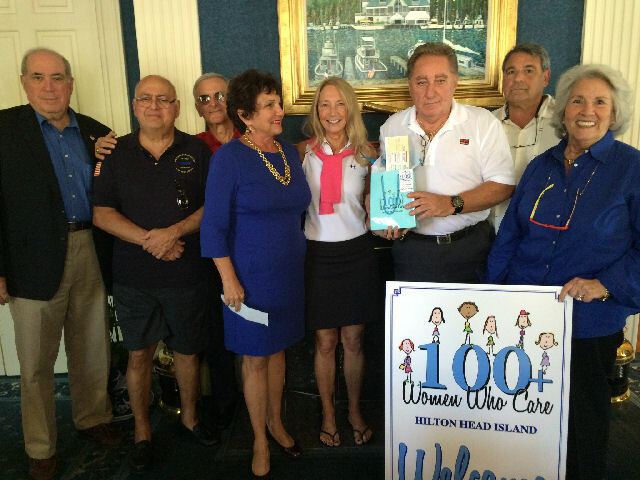 100+ Women Who Care Hilton Head Island proudly presented our third quarter recipient, Second Helpings, with a gift bag of checks totaling $7300! The presentation to Maureen Korzik, Executive Director, took place in the courtyard outside her office, on Tuesday, February 9. This organization, started in 1992, works to supply those in need with nourishing food. The volunteers are on the road, seven days a week, rescuing food from area grocery stores that would have been thrown away. They redistribute it to area agencies that serve the disadvantaged countywide. Our donation will be used to make a difference right here at home! Each volunteer team has a refrigerated truck to use for their assigned pickups and deliveries. The food gets picked up in the morning and is delivered the very same day. Our funds will be used to support the two trucks that deliver to those in need on our beloved Hilton Head Island. Organized five years ago, their goal is to benefit local active and retired law enforcement officers, and their families, who have become ill, disabled, or killed in the line of duty. Our donation will be used to provide a scholarship for either one or two children of officers who serve Hilton Head Island. It will also be used to help a Deputy pay medical bills he has accumulated due to his present battle with cancer. Founded in 2008 by Dr Naren Sharma, NOC's mission is to help the poor and those who are vulnerable through its core programs including education (preschool, after-school, and adult education), health services, and workforce development. Education is NOC's flagship program and the primary beneficiaries are children and women. NOC started with only 5 children and, in just five years, has grown to more than 300 children. It has a strong presence in the neighborhoods and makes a difference in the lives of many people, especially the children, living in low-income neighborhoods.